The thyroid gland, located in the neck, produces thyroid hormone which helps regulate our metabolism. It may occasionally produce too much thyroid hormone (hyperthyroidism or thyrotoxicosis) or too little (hypothyroidism or myxoedema). Imbalance in either direction can cause eye and vision problems. The precise cause of thyroid eye disease, which may be very variable in its manifestations, remains a mystery. What are the symptoms of thyroid related eye problems? A staring appearance and dry eyes are often the first symptoms. Early signs include swelling of the eyelids and tissues around the eye. The eyes can become red and the conjunctiva (the membrane covering the white of the eye) may swell giving a “jelly-like” appearance above the lower eyelids. Swelling of the fatty tissue surrounding the eye and the eye muscles can push the eye forward creating a protrusion of the eye. The degree of protrusion is variable and may involve one or both eyes, adversely affecting the cosmetic appearance and causing irritation, photophobia and watering of the eyes. Swelling of the muscles which move the eyes may produce double vision. In severe cases, the clear covering of the eye (the cornea) may ulcerate, or the optic nerve may be compressed resulting in loss of vision if not treated appropriately. Can thyroid eye disease occur even if thyroid function tests are normal? Protrusion and other symptoms and signs of thyroid eye disease may be present even when tests show a normal level of thyroid hormone in the blood. Most patients with eye symptoms, however, have abnormal blood levels of thyroid hormone. Once an overactive thyroid gland is suspected, the thyroid function must be evaluated and appropriately treated by an endocrinologist (a medical doctor or physician who specializes in the treatment of problems with the thyroid gland as well as diabetes and pituitary disorders). The eye disease may continue to progress even after the thyroid function has been corrected. Any eye problems should be followed and, and, if necessary, treated by an ophthalmologist. Two phases of eye treatment should be considered. The first phase involves treating the active eye disease. The active period, which usually lasts two or more years, requires careful monitoring until stable. The second phase involves correcting unacceptable permanent changes which persist following stabilization of the active phase. 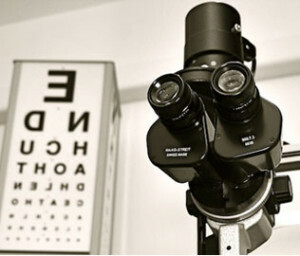 Treatment during the active phase of the disease focuses on preserving sight, and treating or preventing double vision. Medical treatment, such as artificial tears and ointments, steroids (usually given intravenously on an inpatient basis), orbital surgery, and possible radiation (X-ray treatment) of the orbit, may be required. In the second phase, treatment of permanent changes may require surgical correction of double vision, eye protrusion, eyelid retraction and “eyebags”. What is an orbital decompression operation? An orbital decompression operation is a surgical procedure undertaken to create more space in the orbit. Read more about Orbital Decompression. Surgery to deal with double vision is only undertaken when the deviation of the eyes has remained stable for a period of 6 months. Whenever possible, temporary stick on prisms are fitted to glasses to overcome double vision until surgery is deemed appropriate. This surgery is performed by other colleagues who specialize in strabismus (squint) surgery. 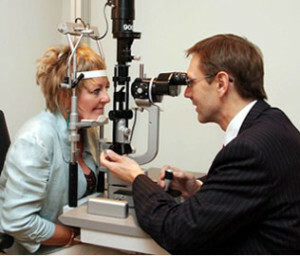 We highly recommend Mr Ian Marsh, Consultant Ophthalmic Surgeon in Liverpool who has over 20 years of experience in such surgery. Upper and lower eyelid retraction may be treated by lengthening the tendons of the eyelid retractor muscles. This is often performed via an incision on the side of the eyelids, avoiding an external scar. This is usually performed under “twilight anaesthesia” for the upper eyelids. This allows greater accuracy to be achieved with regard to the final height and contour of the upper eyelids to achieve the best cosmetic result. Nevertheless it may be very difficult to achieve symmetry and to avoid a flaring of the outer aspect of the upper eyelids. Complications of such surgery include an under or overcorrection of the degree of retraction requiring further surgery. Lower eyelid retraction may be treated by means of grafts taken from the hard palate (roof of the mouth) usually under general anaesthesia, or using dermal grafts (taken from the lower outer quadrant of the abdominal wall or buttock area). Often lower eyelid retraction surgery is not required in patients who have undergone an orbital decompression as the lower eyelid retraction often resolves following such surgery. Upper lid retraction responds occasionally but less predictably. What are the risks of eyelid repositioning surgery? The risks of eyelid repositioning surgery include infection, bleeding and reduced vision, but these complications occur very infrequently. A temporary inability to fully close the eye after surgery is not uncommon. Lubricant drops and ointments are frequently useful in this situation. It is also important to know that although improvement of the lid height is usually achieved, perfect symmetry in the height and contour of the two eyelids and full eyelid movement is sometimes not achieved. More than one operation is occasionally required. What happens after eyelid repositioning surgery? You will be asked to clean the eyelids and repeat the application of antibiotic ointment to the eyelid wound 3 times a day for 2 weeks. The sutures used are usually dissolvable but can be removed after 2 weeks if necessary. Wearing make-up should be avoided for at least 2 weeks. Postoperative bruising usually takes 2-3 weeks to subside. The upper eyelid is often too low initially following surgery, but rises gradually with time. Postoperative swelling may take a few weeks to subside and the final result of surgery is not usually seen for 3-4 months. The upper eyelid scar following a levator recession is hidden within the upper eyelid skin crease. Occasionally the surgery is performed on the inside of the eyelids leaving no visible scars. Severe eyelid swelling in thyroid eye disease may leave the eyelids with a very “baggy” appearance and with excess skin and fat pad prolapses. Blepharoplasty, a cosmetic eyelid surgery operation, involves the removal of excess skin and fat from the lids. This may improve the appearance of the lids but cannot restore normality. This type of surgery for a patient with thyroid eye disease is much more challenging than similar surgery undertaken for cosmetic reasons alone. You will have your blood pressure checked by the nurses. You may also be required to have a physical examination of your heart and lungs by the anesthetist to make sure it is safe for you to have a general anesthetic if this is required in your case. You may need to have some routine laboratory tests, such as urinalysis (tests of your urine), a chest x-ray, or a blood cell count. These should reveal potential problems that might complicate the surgery if not detected and treated early. No testing is usually necessary, however, if you are in good health and younger than age 55. What are the possible complications of thyroid eye disease surgery? Blurred or double vision, lasting mainly for a few hours, and sometimes up to a day or two after surgery. This may occur for several reasons – ointment put in the eyes immediately after the operation, local anaesthetic used in the operation, swelling of the muscles that control eye movement or swelling of the normally clear covering around the eye (the conjunctiva). Swelling of the conjunctiva (this may mimic a severe hay fever reaction) is referred to as “chemosis” and in some patients can take a few weeks to resolve. If blurring persists for longer than 48 hours, it is important to inform your surgeon. What are the possible complications of orbital decompression surgery? Serious complications from orbital decompression surgery e.g. loss of vision, CSF leak (leak of brain fluid), meningitis, are extremely rare. The major potential complication, which must be considered, is postoperative double vision. The incidence of this complication varies considerably from surgeon to surgeon. It is much more of a problem in patients who have some double vision prior to surgery with a risk of up to 30% that this may be worse postoperatively. In patients with no pre-existing double vision, the risk is considerably reduced (<5%). It is rare for any patients who suffer this complication to be left with a significant problem following corrective eye muscle surgery. This risk must, however, be considered very carefully in a patient who wishes to improve cosmesis as this has implications for driving and work. It may be necessary to wait for some months before muscle surgery can be undertaken to improve double vision. In some patients temporary prisms can be fitted to glasses to improve double vision. Our patients are referred to Mr Ian Marsh in Liverpool. He is a recognized expert in squint surgery with over 20 years experience as a consultant ophthalmic surgeon. Reoperation. Further surgery to address any asymmetries may be required. This should be borne in mind. There are a number of factors beyond a surgeon’s control, which can have an impact on postoperative progress e.g. postoperative swelling affecting one side more than the other, which in turn can necessitate re-intervention. What happens after thyroid eye surgery? Click here to watch a video of a patient describing her experience of twilight anaesthesia. She underwent a bilateral upper lid blepharoplasty and endobrow lift at the clinic. To learn more about Thyroid Eye Disease Surgery, please contact us at today to schedule an appointment.